We recently ran a door hangers marketing campaign for one of our clients. It was fun and nostalgic – the old-fashioned way of creating and distributing door hangers. But then we wanted to spice it up a bit by adding some phone conversion tracking. And here's how you can do it too! If you are going to be able to justify the time and money you are going to spend on door hangers marketing (or on any marketing for that matter), you need to first define a measurable goal. In this case the goal was to find new leads via phone call. Once your door hangers marketing goal is defined, the next important task is to come up with a compelling message. Keep in mind that a door hanger doesn't give you enough space so message needs to be simple and clear. It also needs to be geared towards the right audience. Unlike digital Ads and bulk mails, door hangers have a higher chance of someone looking at your content because well, how can they avoid it when it's hanging right on their door? So, be mindful of the message and the target audience. The more targeted the message, the more relevant, higher will be your conversion. When it comes to door hangers, quality is all that matters. Keep in mind you don't have enough space to express your thoughts and leave an impression; so, your next best bet is the quality of the door hanger. Use both the sides of the door hanger and use colors judiciously. a) Go to Twilio website and purchase a number. c) Save that TwiML Bin. d) Now go to the Twilio Phone Settings and set up Voice Handing to 'TwiML' and select the TwiML Bin you just created from the drop down. e) You are all set! Now anytime someone will call that Twilio number, Twilio will route that call to your business phone. 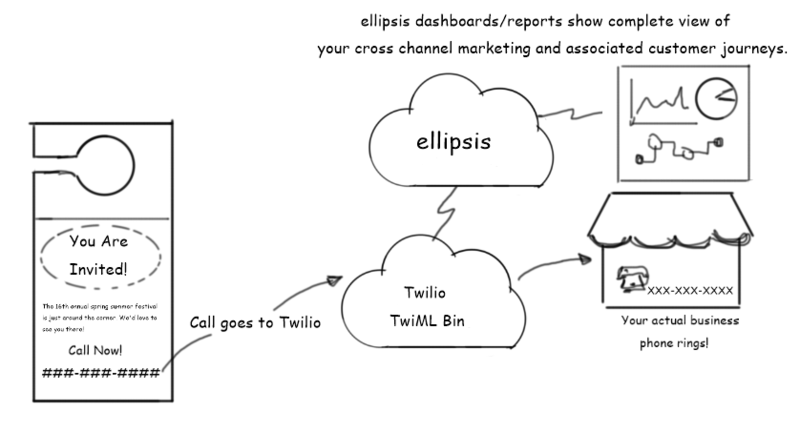 In addition you can use Twilio APIs to track who called and when and show those details into your marketing dashboard. ellipsis is fully integrated with Twilio. So, when you run a campaign using ellipsis you don't have to write a single line of code to do phone conversion tracking. Not just that, you don't even need to purchase a number or have a Twilio account! We have it all set up for you from the get go!